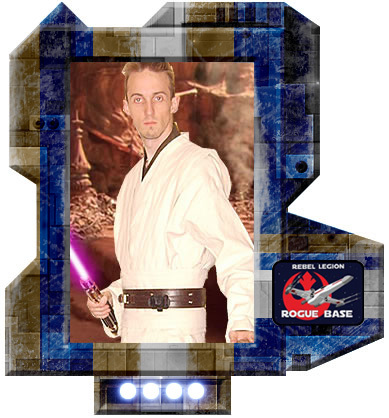 Kaleb Flynn was trained as a Jedi by Har Law'C, a Shistavanen Jedi Master, at the Temple on Coruscant. After His knighting ceremony he left the Temple, saying he felt the Force guiding him to the Outer Rim. He became a nomadic Jedi, following the will of the Living Force to where he was needed. It was in this way that he met the legendary Jedi Master Fay. Flynn began journeying with Fay, learning much from her centuries of experience and strong connection to the Force. Soon after they parted company, Fay made her fatal journey to Queyta. When news of her death reached Flynn he was overcome by grief as he had come to love her in the years they had journeyed together. He returned to the Jedi Temple and requested to serve in the Clone Wars, a request which was denied by the Council as they could feel the desire for revenge flowing through Flynn's heart. He was instructed to remain at the Temple, where Mace Windu helped him temper his emotions and focus his feelings through a brief study of the Vaapad form of lightsaber combat. He also gifted the young Jedi with a violet focusing crystal for his lightsaber. After months of quiet meditation and strict training Flynn returned to the Outer Rim, again following the Living Force. Because of this he was far away from the Clone Troops when Order 66 was issued. The deaths of so many Jedi sent an echo through the Force that was impossible to ignore and Flynn returned to Coruscant immediately. On route, he picked up Obi-Wan's transmission warning all surviving Jedi to stay away and reluctantly went into hiding in the Outer Rim. His current location is unknown.